Hometown: Mine Hill, New Jersey, U.S.
Unit: Army National Guard, Battery B, 3rd Battalion, 112th Field Artillery, Lawrence, N.J.
Sgt. 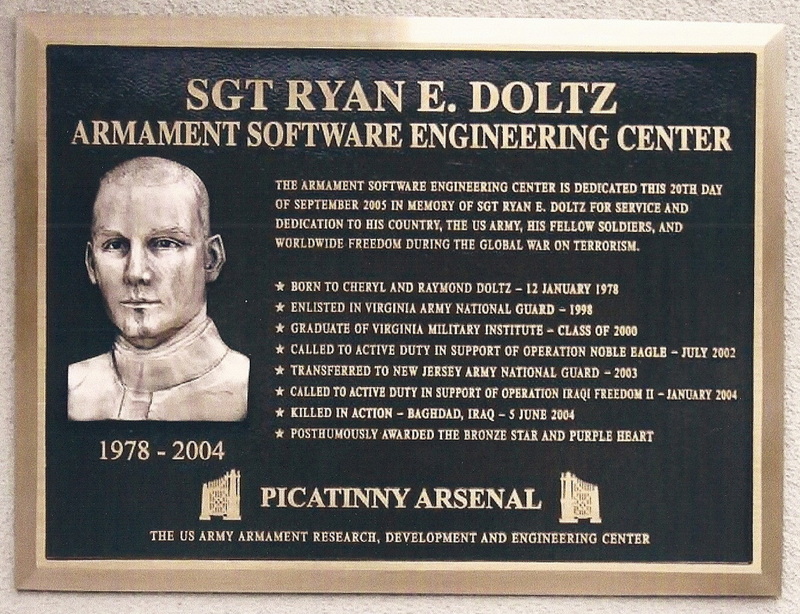 Ryan E. Doltz died Saturday, June 5, 2004. He was killed in action while serving with the Army in Iraq. He was 26. Born in Livingston, he was a lifelong resident of Mine Hill. He was the son of Raymond E. Doltz and Cheryl (Fagley) Doltz of Mine Hill. He served with the Military Police, C Company, 759th M.P. Battalion, U.S. Army, Morristown. 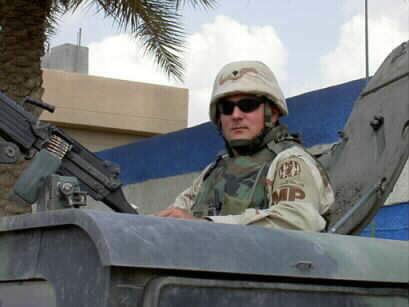 He had been serving as a Military Policeman in Iraq with the N.J. Army National Guard, 3rd Battalion, 112th Field Artillery of Morristown. He previously had served with the Virginia National Guard in Martinsville, Va. He was a member of the Mine Hill First Aid Squad, member of American Legion Post 27 of Dover, and VFW Lakeland Post No. 2347 of Netcong. He was a member of the Class of 2000 of the Virginia Military Institute of Lexington, Va., where he received his bachelor's degree in history and was a member of the Rugby Team and of the Regimental Band. He was very proud of his status as a V.M.I. First Class Private. He had been certified as an E.M.T. in both Virginia and New Jersey. He was also an Army Certified Combat Lifesaver. He was a member of the Mine Hill Presbyterian Church. He is survived by his parents, Raymond E. and Cheryl Doltz; his brother, Greg A. of Mine Hill; and his sister, Anne M. Doltz of Lake Hiawatha. Also survived by several aunts, uncles and cousins; and by his special friend, Theresa Wohlrabe. Funeral services will be held at the Mine Hill Presbyterian Church, 213 Route 46, Mine Hill, (973) 361-6699, on Tuesday, June 15, at 10 a.m. Interment at Arlington National Cemetery in Arlington, Va., on Wednesday, June 16, at 1 p.m. 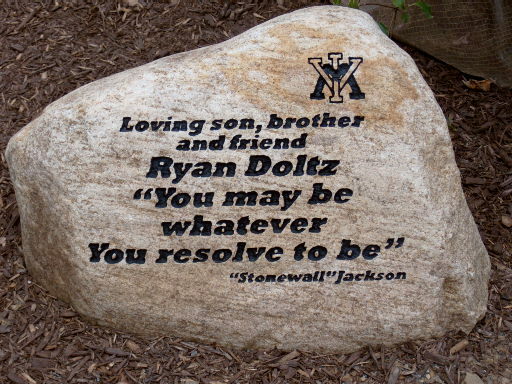 In lieu of flowers, donations are requested in his memory to Virginia Military Institute Foundation / Ryan Doltz Scholarship, Box 932, Lexington, Va. 24450 or to the Ryan Doltz Scholarship, c/o Mine Hill First Aid Squad, Mine Hill, N.J. 07803. Ryan entered this world screaming in the early morning hours of January 12, 1978. The doctors gave him only a 30% chance of surviving due to the fact that he was two months premature. However, he proved the doctors wrong and was able to go home in 11 days, weighing a little less than 5 pounds. Ryan joined his parents, Cheryl and Raymond, and his sister, Anne. Ryan was a very active child and enjoyed making his presence known. By the age of seven months he was climbing out of his crib and running, not walking, everywhere. In early 1979 Gregory joined the family. The two boys were so much alike that many thought they were twins. As years passed they become known as “The Doltz Boys” in the neighborhood. Ryan was a member of the first preschool class at the Hattie Rice Elementary School in Mine Hill. He played soccer, baseball, and his favorite, football. At Dover High School Ryan played football and baseball. At his Senior Football Banquet, one of his coaches described Ryan as an “intelligent player.” He said that Ryan knew all the positions and their plays so that whenever he was called upon he could take over that slot. At 16, he earned a black belt in karate. After high school Ryan joined the Class of 2000 at the Virginia Military Institute. It was to be the last all male class at VMI. He was so proud to be part of that tradition. During Ryan’s rat year at VMI he began playing football, but later switched to rugby. He described it as football without pads, and better after game parties. He was a member of Band Company, where he played the tuba. Never holding rank in the corps, Ryan was proud of his status as a First Class Private. He was also known to many as “Babyface” from a closing scene of a national television commercial featuring four cadets filmed at VMI for Norelco in 1998. While he may have denied it, he loved the attention he received from being recognized, especially from the staff of Hooters. During his cadetship, Ryan earned his Emergency Medical Technician certification in Virginia. After graduation, he was certified as an EMT in New Jersey and became a member of the Mine Hill First Aid Squad. While at VMI three people had a great influence on his life. The first was Joseph Klapatch. Joe was Ryan’s mentor, guide, best friend, and taught him to write the best permits. The second was COL John Brodie, the Regimental Band director. COL Brodie allowed Ryan to direct the Pep Band, which he enjoyed so much. Last, but not least, was COL Tom Davis. He was Ryan’s advisor. COL Davis went “above and beyond” to see that Ryan stayed focused and graduated! His proudest day came in May 2002, when he “walked the stage” to receive his diploma and Bible from General Bunting and Senator John Warner of Virginia. His grin lit up all of Cameron Hall. In 1998 Ryan had joined the Virginia National Guard. He was a member of A Battery 1/246th Field Artillery in Martinsville, Virginia. While at the United States Army Field Artillery Training Center in Fort Sill, Oklahoma, Ryan won the Top Gun Award for military proficiency at section tasks associated with 13B10 training. Shortly after his graduation from VMI his unit was activated to be a part of Operation Noble Eagle. Ryan spent one year on active duty at Aberdeen Proving Grounds in Maryland. In the summer of 2003 Ryan moved home and transferred to the 3/112th Field Artillery of the New Jersey Army National Guard based in Morristown. He began working for Moretrench American Corporation in Rockaway as a Cost Engineer. 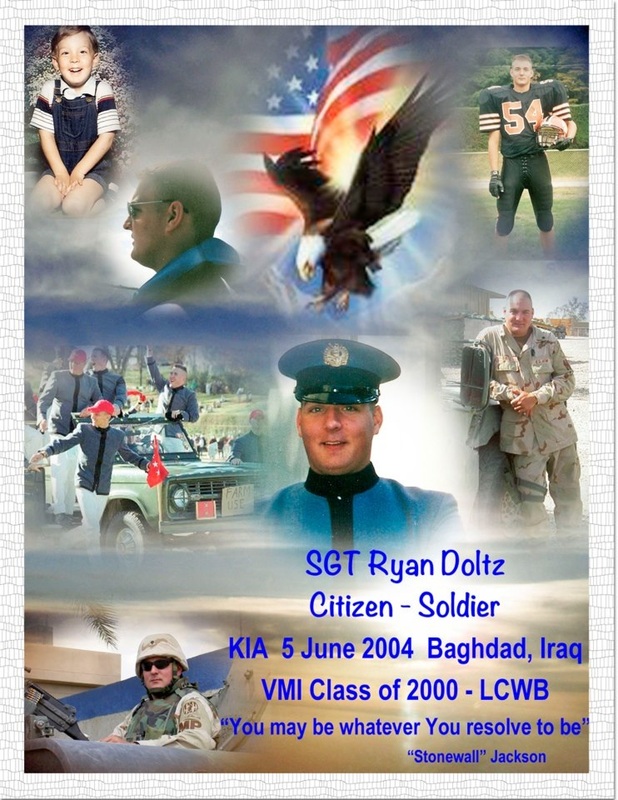 Ryan’s unit was activated in January 2004, to take part in Operation Iraqi Freedom. While training at Fort Dix, he fractured both heels and was sent home. The doctors told him that he would need a wheelchair for six weeks and rehab for six months. Not happy with that prognosis, Ryan set out to prove them wrong and he did. After finally being released by the doctors, Ryan arrived in Baghdad on April 9, 2004. He was determined to rejoin his unit because he said that he trusted them and they know what they were doing. 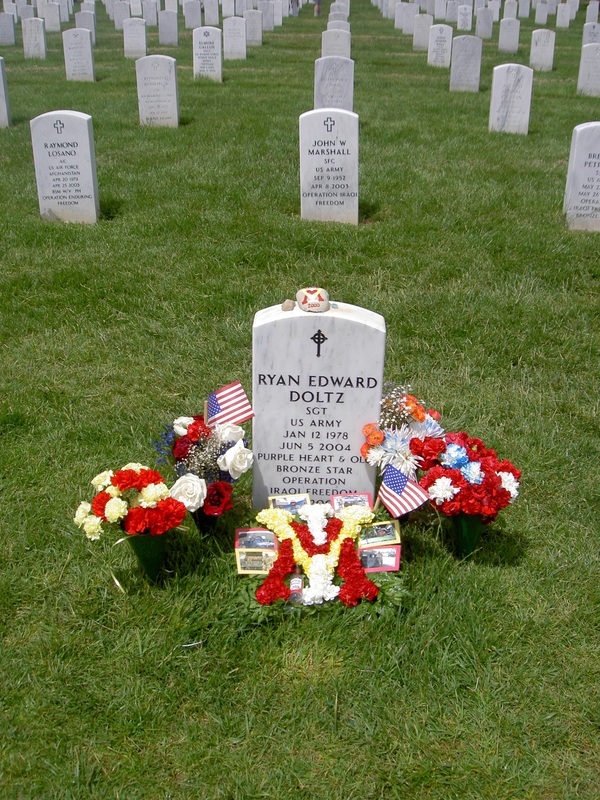 Ryan’s life ended on Saturday, June 5, 2004, when the vehicle he was driving hit an IED as they were returning to their base. Also killed at that time was SSG Humberto Timoteo. Two other members of his National Guard unit, SSG Frank Carvill and SPC Christopher Duffy, lost their lives on June 4, 2004. Ryan was posthumously awarded the Bronze Star, the Purple Heart, and the Good Conduct Medal, as well as being promoted to the rank of sergeant. On June 16th Ryan was laid to rest among our nation’s fallen heroes at Arlington National Cemetery. Ryan’s life was all too short, but he will never be forgotten. His memory will live on in all that knew him. His dedication and willingness to serve his country makes him a True American Hero!